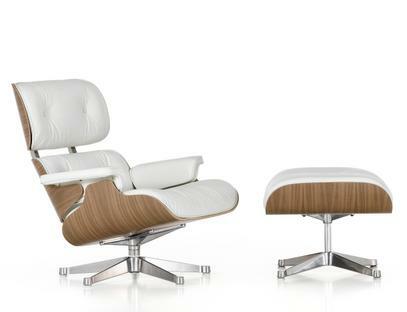 The Lounge Chair & Ottoman White are reissues of the classic Vitra Eames Lounge Chairs, re-designed in 2002 by Hella Jongerius. Designed by the Eames' in reference to the classic English club chair, the Vitra Lounge Chair uniquely combines comfort, luxury, timelessness and style. 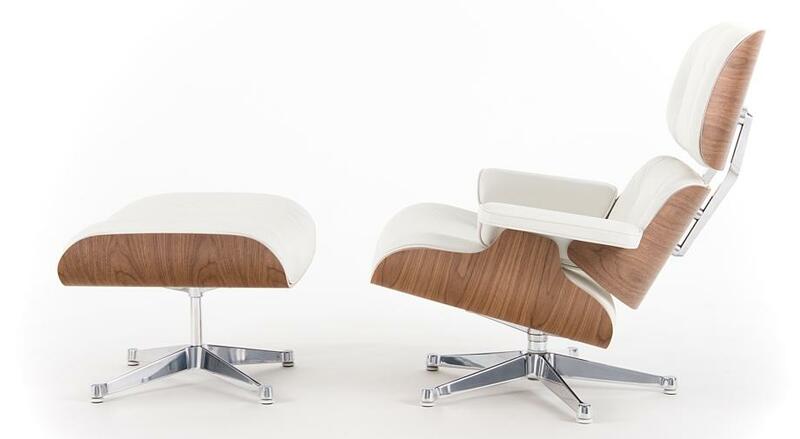 Hella Jongerius updated the original design with white leather covers and a white pigmented walnut shell. Until 31.01.2019 smow will include a LTR Occasional Table with every Lounge Chair & Ottoman purchased. Simply select the desired variant in the configuration and the article will be added to your shopping cart free of charge. Can the Lounge Chair and Ottoman also be purchased separately? Yes, both are offered individually in our shop. Please note however that as wood is a natural product the structure of wood and wood colour can vary between production runs. Thus if you do not buy a Lounge Chair and Ottoman together there is no guarantee that the woods will match exactly. Why are the Lounge Chair and Ottoman available in two sizes? The classic Lounge Chair and Ottoman dimensions correspond to the original designs of 1956. 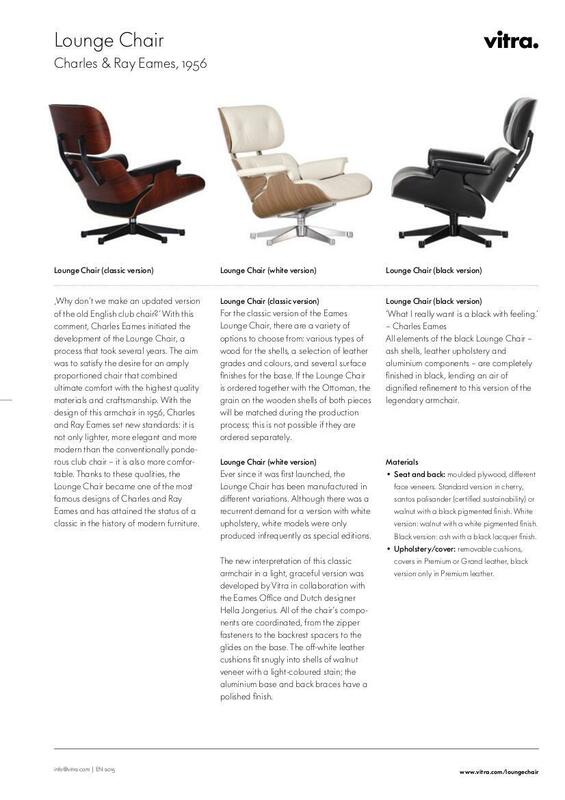 However because the average body size has increased since the 1950s Vitra, in close cooperation with the Eames Office, have adapted the dimensions of the lounge chair to meet today's needs. 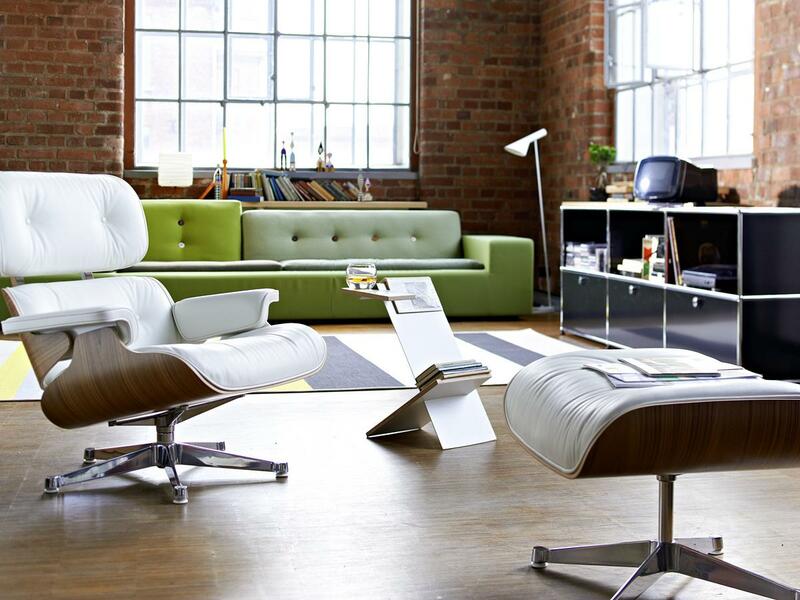 Is there a difference between the Lounge Chairs as produced by Herman Miller and Vitra? Vitra has the distribution rights for Eames furniture in Europe and the Middle East. Herman Miller produce the lounge chair outside this area. Although essentially identical the base of the Vitra Lounge Chair is marginally more streamlined than the American version by Herman Miller. 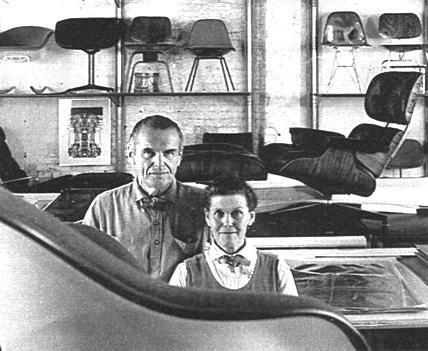 Charles and Ray Eames met in 1940 when the architects Charles Eames and Eero Saarinen were preparing heir entry for the "Organic Furniture Competition" at the Museum of Modern Art in New York. Ray Bernice Kaiser had just finished her painting studies and was undertaking a four-month design study at the Cranbrook Academy of Art when she was assigned to assisted Eames and Saarinen. A year later Charles and Ray married and subsequently worked together in their studio in LA on film, textile, graphic design and building projects: and of course their famous furniture designs. As in the early 1950s Charles and Ray Eames began designing their lounge chair, they had before them a vision of the classic English club armchair: their version combining the best features in a modern design. The design of the Eames lounge chair is characterized by a successful combination of comfort, luxury, timelessness and style. 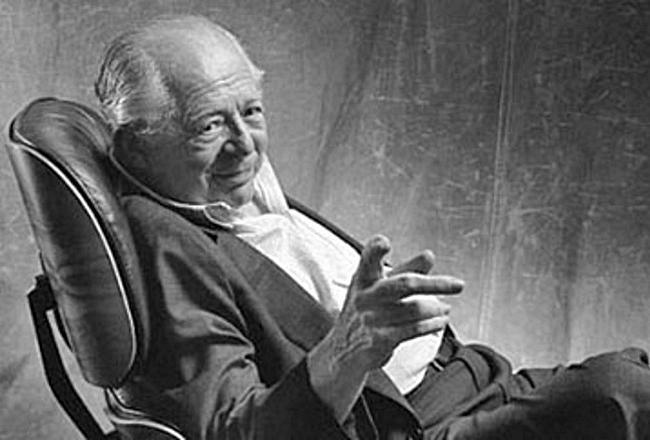 Allegedly the director Billy Wilder was responsible for stimulating the original concept: looking as he was for a chair that was both comfortable and modern. How crucial this impulse was, or indeed how true it is, cannot be confirmed with any great certainty. Wilder was however one of the models who posed in the 1980s for the Vitra promotional campaign "Personalities": posing naturally in a lounge chair with ottoman. 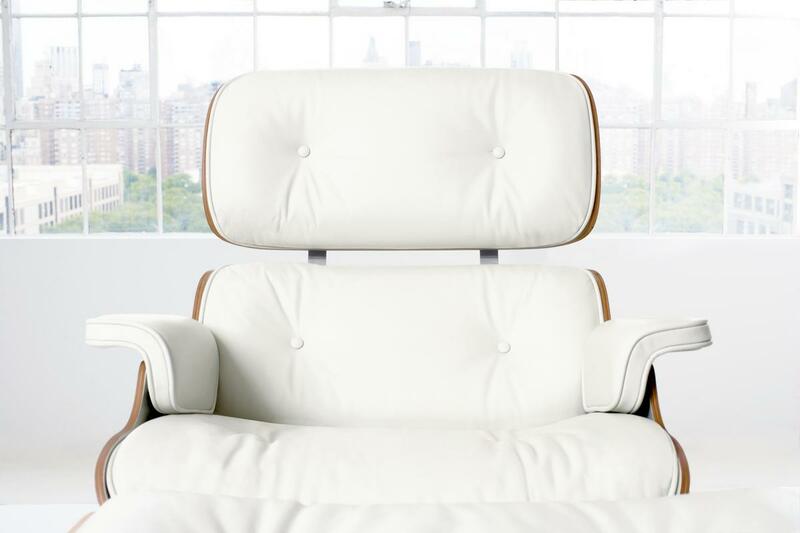 In 2002 Hella Jongerius developed for the Vitra Eames Lounge Chair furniture a new colour concept, a concept which included the Eames chairs in white leather and white pigmented walnut shell. Apart from the fresh colour scheme Jongerius changed nothing. 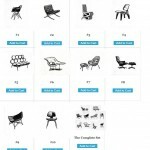 All versions of the lounge chair made ? ?of bent plywood panels on to which are mounted leather upholstery: these upholstered segments are subsequently connected to each other via relatively flexible strap and so-called shock mounts. 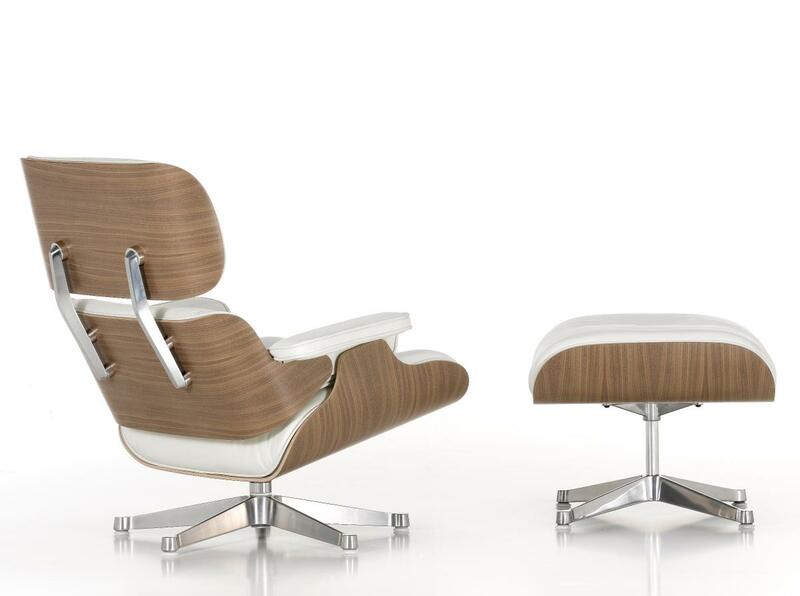 Charles and Ray Eames design is thus reduced to an essence. No part is too much, none too big, everything is in its place and fulfils its function in the best way. 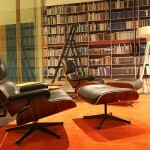 Three years after its original launch the Eames Lounge Chair and Ottoman was admitted to the permanent collection of MoMA New York. 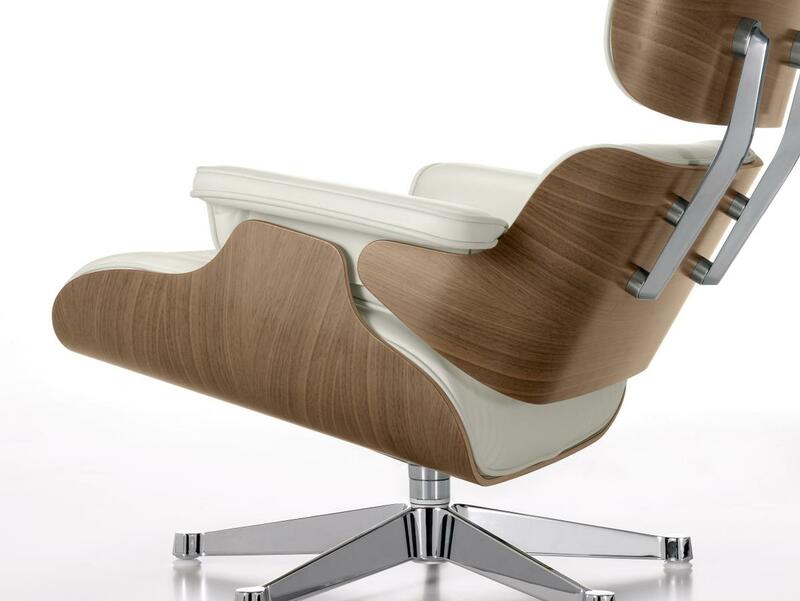 The license for the production of the Eames Lounge Chair in Europe is held by Vitra. 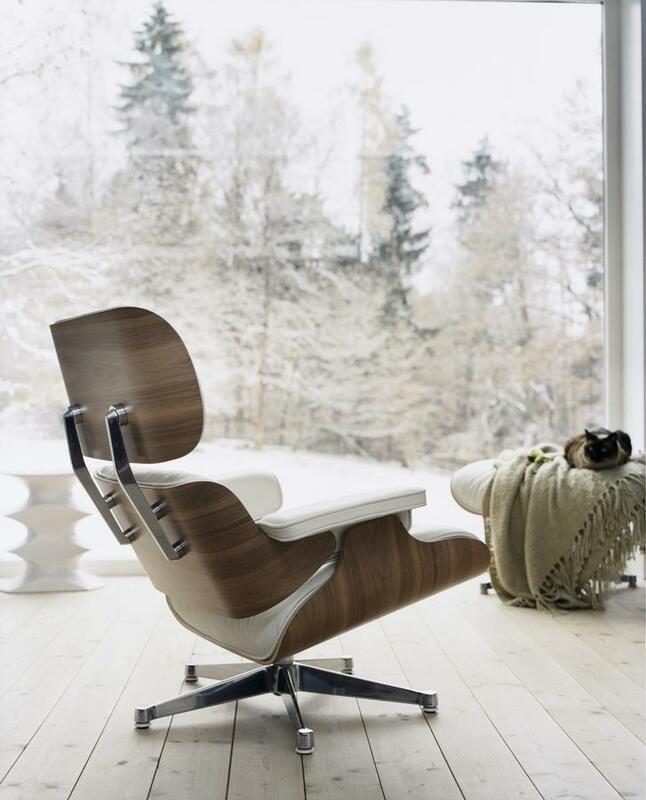 The company, based in Birsfelden, Switzerland acquired the rights to all Eames designs in 1957; and since the Lounge Chair & Ottoman have, more or less, been produced in the same manner. 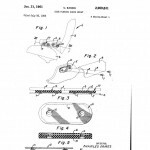 In 47, mostly manual, steps, the plywood shells of the seat, backrest, headrest and armrests are upholstered and connected to each other through combinations of aluminium brackets, screws, hooks, eyes, spacers and shock mounts. 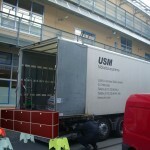 The whole construction is then placed on a rotatable five-point, polished die-cast aluminium, foot. The matching ottoman consists of a single layer wood shell with leather upholstery and sits on a non-rotatable four-point foot. 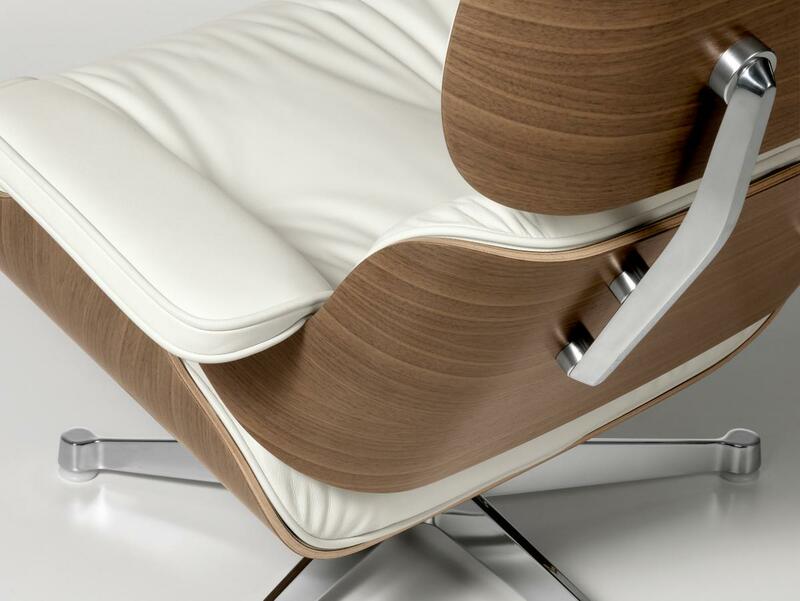 The walnut veneer for the Vitra Eames Lounge Chair White comes, as with the all Vitra Lounge Chair leather, from sustainably managed forests. 24% of the Lounge Chair is produced from recycled content, 29% of the materials can be recycled again. The manufacture process can be enjoyed in its full(ish) glory in the Vitra Lounge Chair Atelier on the Vitra Campus in Weil am Rhein, Baden-Württemberg. Following the privations of the war years, the economy slowly recovered and by the 1950s, especially in the USA, the recovery was in full swing. Consumption had become for broad sectors of the population and central element, and the home became increasingly an important, much loved, retreat from the new world of commerce. Aesthetically these developments were mirrored by the serial mass production of organic, homely designs, largely awash with colour. Against this background Charles and Ray Eames developed their contemporary version of the classic club chair: an object which with its elegant moulded plywood shell and leather upholstery offers acomfortable and modern retreat.